by Phyllis Schlafly, Eagle Forum: Dozens of explanations have been offered by people who think they are savvy about politics to explain why Mitt Romney lost and Barack Obama was reelected despite his many unlawful actions and the high unemployment figures. I toss into the mix my view that the two major political parties need rebranding. Obama’s massive negative TV advertising rather successfully branded Romney and the Republican Party as rich guys who can’t empathize with ordinary hard-working Americans. In fact, Obama grew up enjoying a pampered lifestyle attending elite schools and colleges and now is rich, too, with his wealth and lifestyle coming from the taxpayers. Nevertheless, when the pollsters asked the question, “Who is more in touch with people like you?” Romney lost to Obama by ten points. Why is it that Romney didn’t seem to relate to middle-class Americans? We can’t blame only Romney’s country-club persona for the psychological barrier between him and the bloc of middle-class Americans whose votes he lost. We must also blame the Republican Party’s devotion to policies that allowed, even encouraged, several million well-paying manufacturing jobs to go overseas, leaving behind empty buildings in crucial swing states. Romney didn’t have a message for those Americans, nor did Republican Senate candidates, nor did the Republican Party. So the people who were an essential part of Ronald Reagan’s spectacular victories returned to the Democratic Party, assuming that Republicans care more about their devotion to so-called “free trade” with cheating Communist countries than to protecting good American jobs and a strong American manufacturing base. You would think that Romney and the Republican Party would have learned a lesson from the insensitive way John McCain brushed off the suffering of those whose good jobs were moving overseas. McCain went to Detroit and callously said in debate: Those jobs are gone forever; just go to a community college. The basic Romney-Republican economic message was cutting taxes and regulations to enable people to prosper as entrepreneurs, innovators, and employers. That’s fine, but it doesn’t relate to the millions of men who lost $50,000 jobs and then had to take minimum-wage or part-time jobs that don’t pay enough to support a family. Romney and Republicans also lost the votes of the Millennial generation, some of whom were turned off by our meddling nation-building in faraway lands. Other votes of Americans that should have gone to Republicans were lost because the RINO Establishment, rather than grassroots Republicans, selected the wrong candidate. While Republicans were proclaiming that 2012 was the most important election of our lifetime, 11 million fewer Americans than in 2008 voted for either the Republican or Democratic presidential candidate. Maybe they decided there isn’t any difference between the two major parties, and on the crucial economic issue of loss of good middle-class jobs, there apparently isn’t. The Republican Party doesn’t need only a change in marketing. It also needs a change in policies in order to respect the jobs of middle-class Americans and the choices of grassroots Republicans. It’s time to change Republican economic policy so the Party can be rebranded as the party of family, good jobs, and superior weaponry that keeps America safe without war. Safe without war and Reagan-style peace through strength can help to win back the Millennial generation. The leaks coming out of the RINO Establishment (which made so many 2012 mistakes) impudently try to instruct Republicans what to do now: (1) let the RINOs select Republican primary nominees instead of letting grassroots voters decide whom they want as representatives, and (2) blame the defeat on those who talk about social issues. Let’s remember that it was grassroots Republicans, not the Establishment, that chose winners Ted Cruz of Texas and Rand Paul of Kentucky. The Republican Establishment is also trying to make us believe that Republicans can win by offering amnesty to illegal aliens. That’s a dead end road that translates into more Democratic, not Republican, votes. The Democratic Party should be rebranded as the Party of atheism, amnesty, abortion, and debt. For confirmation of those goals, just read the Democratic Party Platform adopted this year in Charlotte, North Carolina. Voters should watch again that portion of the Democratic National Convention when a voice vote was taken three times on including a reference to God in the Democratic Party Platform, and three times at least half the Delegates loudly voted No. There’s plenty of hope for the Republican Party because 30 of the 50 governors are Republican, and Republicans still have the majority of the House of Representatives. It’s time for grassroots Republicans, with the help of our Tea Party allies, to take control of their Party and set it on a winning path. 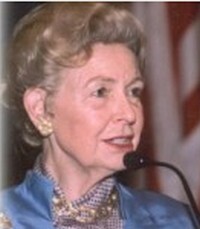 Tags: Phyllis Schlafly, Eagle Forum, political parties, rebranding, Republican Party To share or post to your site, click on "Post Link". Please mention / link to the ARRA News Service. Thanks! We tried taking over the Republican Party in the 2010 cycle. While we got a few Tea Party candidates in office, most primaries were hijacked by the Republican establishment and RINOs were swept into office in large numbers with the Tea Party momentum. Once in office, these establishment GOPers joined the Democrats and immediately began chastising the real Tea Party candidates, branding them as radicals. Establishment Republicans lost what should have been an unlosable election this year, not because they were too conservative, but because they were not conservative enough! The real problem is that leaders in the party care less about the country than they do about maintaining their positions of power within the party. They really don't care that the United States was lost when Barack Obama was reelected, because they maintain the same hold on the power within the party. I no longer identify myself as a Republican, but as a staunch conservative, devoted to the principles that made this country great. It pains me to say that I don't believe that can be turned around--the party is too far gone. I think the election was stolen with dead people voting, more votes cast than registered voters in many precincts, voting machines set to throw votes from Romney to Obama, ballot boxes stuffed by early voters?, etc.